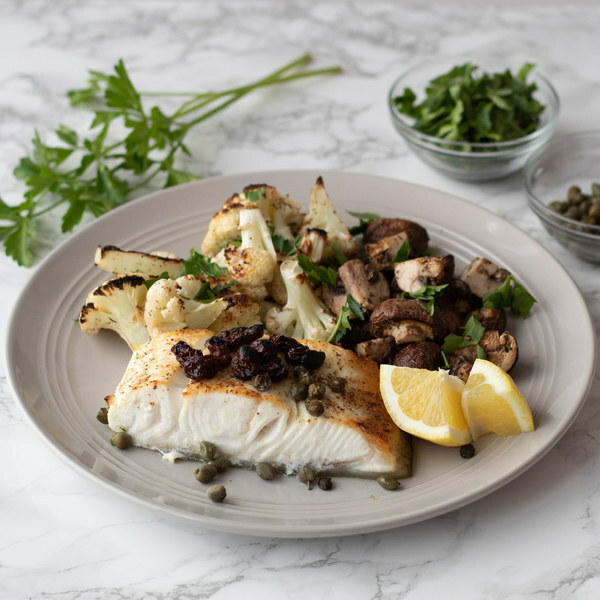 ← Broiled Caper Halibut with Cauliflower & Mushrooms. Preheat oven to broil and position rack about 6 inches under the broiler. Remove leaves from cauliflower; cut into bite-sized florets and place in a large mixing bowl. Cut mushrooms into quarters and add to the bowl with the cauliflower. Drizzle cauliflower and mushrooms with oil and season with thyme, salt, and pepper; toss to coat. Place veggies on a parchment lined baking sheet. Place baking sheet in oven and broil until golden, 6-8 minutes, tossing halfway through. Shave leaves from parsley stems; discard stems and mince the leaves. Set aside. Cut lemon into wedges and set aside with parsley. Spread the oil over the halibut using a spoon or your hands and season with salt and pepper. When cauliflower is golden, place fish on top and sprinkle with capers. Broil untill the fish is opaque, 5-7 minutes. When fish is cooked, sprinkle with raisins and broil untill raisins are plump and hot, about 30 seconds. Divide halibut and vegetables between plates and drizzle with vinegar and any accumulated pan juices. Top with parsley and serve with lemon wedges. Enjoy!